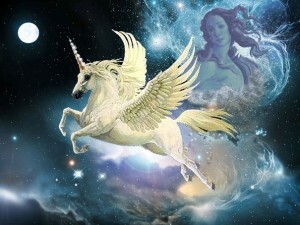 Image: Unicorn Pegasus heads toward Earth with Venus’ blessing.Web collage by Dana Hunt. This New Moon sets our intuitive Sag-sights from a deep impulse, as it amplifies Mercury’s retrograde dive deep into the Heart of the Milky Way Galaxy at 26 Sagittarius. Set your sights into the New Year and out two and a half years, which is Saturn’s time frame in Capricorn. Stepping in time with the Solstice Sun, Saturn claims this New Year as his domain. We have about 30 months to fulfill a significant accomplishment. Name yours, draft a game Plan A, and keep a Plan B and Plan C on hand. Saturn leads the way across the Unicorn cusp that joins the imagery of the one-pointed arrow of Sagittarius and the mythic Sea-Goat of Capricorn. The Moon, Saturn, Sun, then Venus follow. Mercury, the Trickster, has circled and welcomed Venus into Sagittarius to light up this New Moon with her holiday cheer and join Saturn for a spectacular Solstice celebration. Consider this Saturn Solstice as the true New Year. Mercury completes the celestial caravanserai, turning forward on December 23, then crossing the Unicorn cusp on 1/11 with final New Year greetings and pulling another resolution or two out of a back pocket. This has been a very deep Mercury retrograde process, taking stock of the whole of 2017 to see what you have accomplished, experienced, let go of. How are you thinking differently about things than in January 2017? This year brought us a clearly a memorable beginning, inaugurating unprecedented circumstances that required each of us to step forth and show up all the way through the “Great American” Total Solar Eclipse that announced huge storms on all levels. In what ways has your life been turned inside out? Are you ready for 2018 and its New Year/New Agenda? What other planets are players in this New Moon pattern? delivers a rash of surprises from incoming cosmic showers of fresh electromagnetic frequencies. Are you picking up the new wavelengths coming in on solar winds and galactic frequencies? Whatever is going on with the rare weather, storms, fires and earthquakes—we are on alert. Never a dull moment in this wake up call to explore uncharted wilderness areas in your brain and pristine crystal radiance in the inner chambers of your heart. A new scientific discovery has seen stars forming within the powerful outflows of a supermassive black hole. This agrees with unified field physicist Nassim Haramein’s findings that, especially at the active event horizon of any “whole,” energy is transferred in both directions. Such intense interstitial dynamics can birth awesome energetic effects. Go for it! subtly (or sometimes not!) evokes a quantum shift, pulling the rug out from under our feet. We find ourselves swimming in unfamiliar seas. The Big Quest and Question: what is real? What illusionary reality are you caught up in? What does it take to alter it and invite a brighter experience? This is like being a sea creature called to land, or a drop clarifying its essence and participation in the larger ocean. This has been the ride of 2017, the wave we ride into 2018, when Chiron enters a new sign. As we light up more of who we each are, soul groups are gathering, coming together, reconnecting, making new connections, spinning karmic webs, co-creating, celebrating with heart. I have been hearing (and experiencing) some amazing serendipities that clearly demonstrate this theme. Haven’t you? It’s happening on many levels, very exciting, especially when we can depersonalize in relation to ourselves, allowing certain (limiting) self-identities to wash away. It can feel like wriggling out of too-tight clothing—just like the snake has to wriggle out of that dry old skin. Take your time, but keep moving. Love is always the ultimate experience toward which we passionately yearn in life. It all comes back round to Saturn on Solstice, just in time for Mercury’s forward motion. Aim true and let fly the bright Arrow notched on the bow of this New Moon. Let’s feel deep into the Heart of Space as we follow the light into the New Year. I WISH EVERYONE A LOVELY HOLIDAY SEASON, CELEBRATING THE DEEP AND DARK, THE BRIGHT AND LIGHT AT THIS TURNING POINT OF THE YEAR!